“Devil in the White City,” written by Erik Larson, is a true story of how the fabulous Chicago World’s Fair in 1893 was designed and built to become a magnet for people, the story of the architect’s fight to build it, and spine-tingling stories of subsequent murders and deceit. This book then, “Devil in the White City,” is three stories in one; a big city, proud, outdoing itself to attract the world, an architect who fought to keep his vision alive in the face of opposition, and a monster who used the magic attraction as bait for his evil deeds. The city was hosting the World’s Fair (officially named World’s Columbian Expedition) and the buildings and displays within it were painted white. It was also the first group of buildings totally lit by electric light, thus earning the name of “The White City.” It could be seen from far away and enticed people from all over the world to come to Chicago to see its fascinating and numerous wondrous exhibitions. The man responsible for this stunning vision was Daniel Hudson Burnham, an architect famous for his building designs all over America. But he had to fight those jealous of his success, who wanted their vision of the World’s Fair to prevail. They were quick to put the blame for anything that went wrong, no matter how small, on Burnham’s shoulders. However, he continued the battle and finally won out. His White City was a rousing success with the sponsors and other nations who erected displays as well as the hoards of people attending from all over the world. But there was a drawback to the vast and diverse crowds of people. One man took advantage of that fact and used it as his hunting ground. His name was Herman Mudgett (aka Dr.H.H. Holmes) and he would go into crime history books as one of the earliest, most intelligent, cold-blooded, proficient serial killers who ever lived. You see, there was a “science” to the way he did it, which author Erik Larson researched and reveals to the reader. Although there were many ways he used to attract people into his clutches, I will reveal only two of them here, which I believe were the most diabolical of all. He designed and paid numerous construction companies to erect a building for his “pharmacy.” The building was not too far away from The White City, and was honeycombed with numerous rooms on different sides of the building. They also had puzzling and strange inlets and outlets which were designed for a specific purpose. Many construction crews worked on the building, but none of them ever had a full blueprint, or ever finished any more than just their section. Then another crew would build another section with a connecting door, but they were watched and never allowed to go into the other section they had not worked on. By the time it was finished, it was a maze of a genius, murderous mind. Nobody went to the World’s Columbian Expedition for only a couple of hours. It covered more than 600 acres, with 200 buildings housing exhibits from 46 countries. When you visited from out of town or state, you naturally planned a vacation, giving you time to visit all the fascinating new things that were offered. People found it difficult to find lodging as the crowds increased and that made Herman Mudgett AKA Dr. H.H. Holmes happy, because that was a bonus for his evil purposes. Some people were a little shy and nervous being away from home and maybe in a big city like Chicago for the first time. But Dr. H.H.Holmes advertised lodging at a reasonable price, in his building, located only 16 blocks from The White City. It seemed like a bargain, and the fact that he was a respectable Doctor assured them of their safety……..and many people took advantage of the low rates…never to be seen again. If you like murder mysteries, this one will grip you like no other, because it is NOT fiction, but true history. The deliberateness of the killer’s actions, his methods of setting up his bait amidst all the beauty and glory of a world wide event results in a chilling tale of murder, mayhem and eventual redemption in the teeming city of Chicago. If you like history, mystery and murder all rolled up in a beautiful setting like “The White City,” this is a book that you won’t want to put down until you’re finished. And then, like me, you’ll probably read it over again. Author Erik Larson’s research into this era and the events that transpired is thorough and detailed. You’ll feel as though you’ve been transported into that time and place. Erik Larson doesn’t rely on bloody gore to entice his readers. His newspaper background instilled in him the drive for thoroughly researching his material. He writes of each event’s impact on the people involved and the actions that led to its eventual climax. His book “In The Garden of Beasts” is another thrilling story of the days when Hitler loomed large in many people’s lives. It answers questions such as “Why did the people not shut Hitler down before he gained such power?” or “Why did they allow such atrocities to continue?” It’s a book you’ll find riveting. Erik Larson is a contributing writer for The Wall Street Journal and Time Magazine. His magazine articles have been published in The New Yorker, The Atlantic Monthly and Harper’s Magazine, among others. He also taught non-fiction writing at San Francisco State University, Johns Hopkins Writing Seminars, and at the University of Oregon. He does public speaking events too. 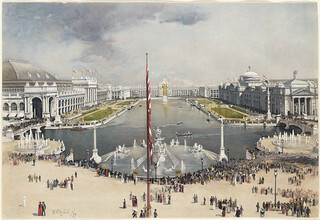 For more historical information about the 1893 World’s Fair in Chicago… – Try this link. Wikipedia on World’s Columbian Exposition (World’s Fair) in 1893It was a sight to behold…a city entirely lit up with electric lighting…painted white to show it off. Wikipedia has more information for history buffs here. I hope I’ve given you enough information about the book and its author, without giving away the entire story. It’s a fascinating study of a time long before the kind of communication we have now, which caused each individual great challenges in their objectives. More books by Erik Larson, available at these links from Amazon. Oh, wow, I have never heard of this ghastly “Devil In the White City” tale! Coupled with your history, the book trailer sure adds to the mystery. This would be a great book to read on a dark and stormy night.